Home Magic Archive for category "Workings"
If you read this website with any regularity you most likely know that it is my practice to occasionally do a magical working that I term a “calling”, literally meant to draw others who meet certain criteria to find me and/or the otherkin community itself. I typically use what I term a “poetic focus” as the basis for this calling – or, in other words, a spoken invocation. Two of the invocations I have used in the past are here and here. It is time once again to renew that calling. But this time, after the recent essays on sigilization and thoughtfoms, I thought I might do so a little differently. This time, I am going to build a servitor. The core of this servitor will be a sigil. I wanted something easily reproduced and with an obvious association with the otherkin community, so I have created a starlike image with seven arms, each arm drawn from the outside moving in. It is not the typical septegram, but the association between the two symbols should be obvious. As a name for the servitor, I will chose the word “Shakto”, being part of the Aloryan phrase “Shakto-tha lien” which means roughly “show yourselves” or “come forward”. 1. To seek out those with nonhuman or otherworldly lives which have touched them deeply, and to help them awaken and to find the otherkin community. 2. To help those otherkin who have shared such lives in the past find one another again. The next step is, of course, to decide on a form for the servitor itself. At first I was thinking a white hart, as in some celtic myths, but in this case I am feeling more inclined towards a modern myth: the white rabbit. One might even picture his sigil as the many hands of a very strange pocket-watch, though this rabbit is never late. Nor is he early. He comes precisely when he needs to. But he will lead you down the rabbit hole. After charging and empowering the servitor I have linked it to both of my existing callings, and sent it out into the wild and the web. It is self-sustaining and from one point of view replicating (it is a rabbit after all) though from another it simply takes advantage of a rather interesting understanding of time. I look forward to observing it at work. If you’ve sat through this whole series I do have one last surprise for you. A sigil designed for attunement. 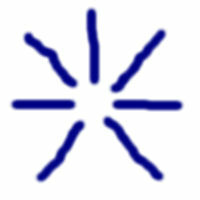 This sigil and the thoughtform it represents have been created to attune someone to the full spectrum of Otherkin Reiki energies and thoughtforms. At this time that includes Usui, Karuna, and Imara Reiki and their associated symbols as the base, all of the channeled and intentionally created symbols/sigils listed on this site, and the four symbols channeled by Crisses listed on the Open Source Reiki website. 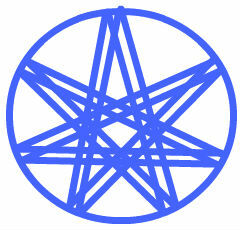 While this might look like a complex symbol at first, it’s drawn easily if one draws a normal septegram using two fingers held apart, bringing them together to draw the circle around it. If you’d like to use it on yourself, I’d suggest meditating on the symbol with that intent. Originally posted to the WanderingPaths mailing list on April 8, 2011. This was written as a poetic focus used as part of a Calling to the spirit the otherkin community once had. but we kept going strong. and what's been the cost? and what have we lost? who danced on the wind?